I have two collections of poems, both published originally by Pariah Press. They are now available directly from me if you live in Australia. Outside of Australia, please click on the button below for Thicker Than Water. Below are some quotes from reviews and readers - click on links to read some poems from each collection. 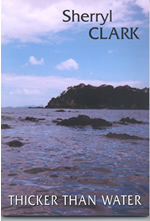 “In Thicker Than Water Sherryl Clark has produced a marvelous expositional journey through the maze of family; those things which have been and gone and those we carry with us all our lives to make us what we are. She takes this further into her current life and continues to carve out some wonderful new territory in Australian poetry. Read some poems from this book. Price: $18.00 includes GST and postage within Australia. For overseas purchases, click on the button at the top. Send cheque (made out to Sherryl Clark) to P.O. Box 532, Altona North Vic 3025, Australia. Australian dollars only. Price: $18.00 includes GST and postage within Australia. If you live outside Australia and would like to purchase Edge, please click on the button below. You may also be interested in Poetrix magazine.